My grandfathers' lives and relationships continue to surprise me. Almost exactly one year ago, I discovered that my paternal grandfather, Julian Prokopowicz (1895-1951), had fellow-immigrant cousins in New England that I had never heard about. Last week I discovered that Józef Prokopowicz, the half-brother of my maternal grandfather Aleksandr Prokopowicz (1878-1939), actually was not his brother at all, but his cousin. Julian in Worcester, Massachusetts, and his cousins in Pawtucket, Rhode Island, lived about forty miles apart—not all that far, but maybe just far enough to limit their visits. Aleksandr and Józef, on the other hand, were close throughout their lives. They grew up in the same small village (probably in the same small house) in Russian Poland and jointly planned their immigration to the United States. Their wives and children sailed together when the time (and money) arrived for steerage tickets to a new life. Aleksandr's and Józef's families settled within a quick walk of each other in Worcester, Massachusetts. Aleksandr and wife Stefania, and Józef and wife Maryanna referred to themselves as in-laws, as uncle and aunt to each others' children; those sons and daughters were cousins, and friends in their early years. When Aleksandr died, he was buried in Józef's family plot in Worcester. My mother, who outlived the rest of her family, was always quick to note, however, that her father and her uncle were "half-brothers, not full brothers." She knew no more than that. Did the men have the same Prokopowicz father, and different mothers? Or different Prokopowicz fathers, and the same mother? When I asked newfound second cousins (Józef's grandchildren) a few years ago, they knew as little as I did. Using microfilmed church records from Iszczolna parish in what is now western Belarus, I have tried to document Aleksandr's and Józef's origins. However, there are no films for 1870, 1872, and 1874-1877, a significant gap, especially for their parents' child-bearing years. Lacking access to six years' worth of records, I know I am missing information that is vital for my genealogical research. The records I have found make me certain of that. A few nights ago, I approached The Half-Brother Question from a new angle, using a really wonderful resource: ePaveldas, a portal representing several archives, libraries, and museums in Lithuania. These distinguished institutions collaborate in making much of the nation's cultural heritage accessible by digitizing their holdings. A fairly recent addition is numerous metryki and censuses from Żołudek parish. This is somewhat surprising because today's national boundaries place Żołudek, long a part of the old Roman Catholic Diocese of Wilno, in Belarus, not Lithuania. To my knowledge, Żołudek is the only parish in my ancestral Lida region whose records (an incomplete set, from the 1670s to the early 1920s) appear on ePaveldas. Particularly because some very important records from Iszczolna parish elude me, I hoped I might find hints in Żołudek parish records to solve the half-brother mystery. This seemed possible because Józef Prokopowicz had married a young Żołudek parishioner, Maryanna Baniukiewicz of Łopaty village. (A 1913 baptismal record from Our Lady of Częstochowa Parish in Worcester for the couple's youngest child identified their parishes of origin in Europe: Iszczolna for Józef, Żołudek for Maryanna.) Based on their oldest daughter's birth in March 1901, I guessed that Józef and Maryanna had married in 1900. In the ePaveldas collection of text documents labeled Rankraščiai (Manuscripts), I found two relevant Żołudek parish books: 1895-1901 premarital examination questionnaires and 1897-1906 marriage banns announcements. I began with late 1899 banns, and quickly found Józef and Maryanna's three readings listed for 30 January, 2 February, and 7 February 1900. Couples' names and reading dates were in fact the only information the banns books provided. Knowing the banns dates, I quickly located Józef and Maryanna's questionnaire, which the Żołudek parish priest had filled out with them on 7 February 1900. I have not yet located 1900 Żołudek marriage records on ePaveldas, if they are there, but I can theorize that Józef and Maryanna were wed soon after the questionnaire was completed and by 27 February 1900. Many weddings took place on the same day as the third reading of the banns. Ash Wednesday was 28 February, and Polish Roman Catholics traditionally did not marry during Lent. 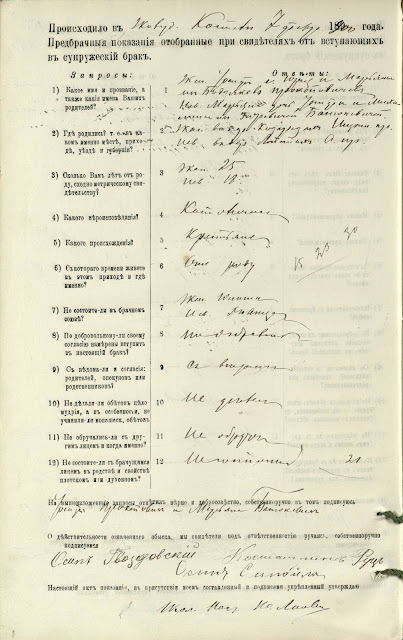 What I hoped, from either a questionnaire or a marriage record, was to learn the names of Józef's parents—whether, as half-brothers, he and Aleksandr shared the same father, or the same mother. What the questionnaire (shown at right) instead revealed was that they shared neither. They were not brothers at all. They were first cousins. According to the questionnaire, Józef's parents were Jerzy Prokopowicz and Marianna Badziuk of the village of Kozarezy in neighboring Iszczolna parish. My grandfather Aleksandr's parents were Kazimierz Prokopowicz and Paulina Zubrzycki, also of Kozarezy. Jerzy, born in 1840, and Kazimierz, born in 1845, were both the sons of Stefan Prokopowicz and Anna Piwowarczyk, who had nine children in all. This is the point at which I have to explain what documentation I have for some of these family relationships, what documentation I do not have, and what questions arise from the lack of records. That mix serves as the backstory for scenarios that I can honestly only imagine, by way of explaining how and why Aleksandr and Józef came to be described as half-brothers. For good measure, I'll add the Polish language into the mix, since it is replete with vocabulary terms for all manner of family relationships. Żołudek parish metryki record the marriage of Jerzy Prokopowicz and Marianna Badziuk in October 1866. I have found baptismal records for six children born to them between 1867 and 1879: Rozalia, Michalina, Marianna, Józef (born in 1873), Stefania, and Magdalena. All were born in Jerzy's home village of Kozarezy and baptized in Iszczolna parish. Jerzy died at the age of 40 on 24 December 1880, survived by his widow and all of the children except Michalina and Marianna, who died earlier. My grandfather's family is less well documented. What I have found in church metryki is spotty at best, due to that lack of microfilmed records for six years in the 1870s. Wasiliszki parish reports a marriage between Kazimierz Prokopowicz and Katarzyna Leonowicz in May 1869. The groom's age, village, parish, and parents' names all agree with the details in Kazimierz's 1845 Iszczolna parish baptismal record. The bride's data are equally clear, so the record seems straightforward and accurate. However, I have found no further references anywhere to Kazimierz and Katarzyna as a couple. Most likely because of that unavailability of six years of church records, nine years pass before Kazimierz plays a documented role in another sacramental event. In October 1878, Iszczolna parish metryki announce the birth and baptism of Aleksandr Prokopowicz, the son of Kazimierz Prokopowicz and Paulina Zubrzycki, residing in Kozarezy. Next documented is Kazimierz's death in Kozarezy on 6 January 1881. Listed as survivors are his widow Paulina, son Aleksandr, and daughter Józefa. Presumably, Kazimierz's first wife, Katarzyna Leonowicz, died before his marriage to Paulina Zubrzycki, but where and when? I have reviewed the 1869-1871 films for Wasiliszki, Iszczolna, and several surrounding parishes and found no mention of her death. Nor is there any indication that Kazimierz and Katarzyna had any children in the first couple years of their marriage—highly unusual for young Catholic couples in that era. (My search continues, in other parishes.) At this point, I surmise that Katarzyna died sometime during the unfilmed years of 1870, 1872 or 1874-1876. Was Katarzyna the mother of "daughter Józefa" mentioned in Kazimierz's death record? Did Katarzyna perhaps die in childbirth? When did Kazimierz marry Paulina Zubrzycki? Again, those unfilmed years probably hold the answer, and the marriage record. The Zubrzycki family lived in Iszczolna parish, so the marriage almost certainly took place there. Was Paulina the mother of "daughter Józefa"? Kazimierz's death record offers no clue to his children's birth order, since it follows the traditional pattern of naming surviving sons (in descending order of age) before surviving daughters. At any rate, there seems no reason to think that Kazimierz ever fathered a son named Józef. So how and why did Józef, documented as the son of Jerzy Prokopowicz and Marianna Badziuk, and Aleksandr, documented as the son of Kazimierz Prokopowicz and Paulina Zubrzycki, come to be described as half-brothers when they were in reality first cousins? I have a theory. I may never be able to substantiate it, unless I someday have the opportunity to see an Iszczolna parish census conducted in 1881 or later. But this is it, with a little background on the Prokopowicz family and the village they lived in. From the early 1800s on, my maternal Prokopowicz family lived in Kozarezy, a tiny village just east of Szczuczyn. The 1795 Russian rewizja (revision list, akin to a census) listed 5 households in Kozarezy; the 1852 parish census, 10 households; and the 1890s-era Slownik Geograficzny, "8 houses, 90 residents." I do not know how many of those houses the Prokopowicz family occupied circa 1880. Probably two. When I visited Kozarezy in 2001, one was still occupied by an elderly Prokopowicz widow (her husband was descended from Michał, the older brother of Jerzy and Kazimierz). If my assumption is correct, the deaths of the two husbands/fathers left a Prokopowicz household of two 30-something widows and six children ranging in age from about 10 months to 13 years. As the only sons, Józef and Kazimierz undoubtedly shared a lot of family responsibilities as they grew up; Józef, older than Kazimierz by five years, might easily have been seen as the "big brother" in this mixed brood of cousins. It is also possible that one of the widows might have died while the children were growing up, leaving the other to serve as a mother to them all. If that happened, it might have strengthened the children's bonds and blurred the lines somewhat between siblings and cousins. There may well be several other scenarios that I have not even imagined. I simply do not know the families' living arrangements. How did Marianna Badziuk Prokopowicz and Paulina Zubrzycki Prokopowicz and their children define their connections to one another? The Polish language has very exacting terminology for several categories of family relationships, particularly distinguishing relatives on a mother's side of the family from those on the father's side. For example, wuj is a maternal uncle, and stryj is a paternal uncle. Brat is Polish for "brother." Brat also is an element in several other family terms. A full brother is a brat rodzony. A half-brother might be called a pół brat, or a brat przyrodni; the latter also signifies step-brother. A male cousin might simply be called kuzyn, or more specifically, brat stryjeczny if he is the son of the father's brother. To a father's siblings, that same son is a nephew, or bratanek. Whether it is used in reference to a male child himself or in reference to his father's relationship to others in the family, brat thus has many applications in the vocabulary of family relationships. How did the men finance their journeys? My mother always explained it like this: "My father and his half-brother sold the family farm to their two sisters to get the money they needed. They knew they were never going back there." One sister, my mother had been told, had "a crippled leg, injured in an accident involving a horse," and owning an interest in the farm might improve her chances for marriage, the two men thought. Many, many times when I was growing up, I heard my mom and her older sister, my Ciocia Paulina, tell that story about Aleksandr and Józef selling the farm. I never questioned any part of it. Like many family stories held up to closer scrutiny, though, it is rather puzzling. Who exactly were these "two sisters"? Józef had three—Rozalia, Stefania, and Magdalena—assuming none had died between 1880 and 1910. Aleksandr apparently had a sister named Józefa (I know nothing about her, but find it interesting that Józefa was my mother's baptismal name). He also had two half-sisters, Malwina and Anna, born to his widowed mother Paulina several years after Kazimierz's death. To sum up two families' worth of siblings and cousins: Neither my grandfather Aleksandr nor his cousin Józef had any brothers at all. They chose to describe themselves as half-brothers for reasons that I can only guess at, but that suggest a deep bond. Józef had five sisters, three of whom outlived their father. Aleksandr had one sister and two half-sisters. How these women came to be recast in family lore as "two sisters" is another small mystery. Perhaps all but two had married, or had died, by the time the family farm changed ownership circa 1910? I would very much like to see the deeds and documents detailing that sale, if it is ever possible to access them through some archive in Belarus or Lithuania. If I am very lucky, maybe someday records from Iszczolna will appear on ePaveldas. Next: Re-examining records of Aleksandr's and Józef's lives from Wilno to Worcester. Did I miss some important clues? Did I ignore some red flags?